While David Belle is unquestionably known as the original innovator and spiritual figurehead of parkour, the discipline’s origins can be traced directly back to his father, Raymond, and his time as a child in Vietnam. Though details surrounding Raymond’s early life are rather hazy, it’s generally accepted that he was separated from his parents during the First Indochina War and taken in by the French military in the city of Da Lat as an orphan at just age 7 in 1946. According to later interviews with his son, Raymond was routinely abused as a child, which motivated him to become as physically fit and strong as possible so that he could protect himself and escape danger if it ever presented itself. While being raised in the Da Lat French military orphanage, Raymond underwent basic military training and education, the former of which he excelled at. As it turns out, Raymond would regularly sneak out at night and secretly use the obstacle course, repeatedly performing the same actions again and again until he’d boiled them down to their most efficient and basic forms. To test himself, Raymond would also devise his own obstacle courses consisting of objects in the natural environment and attempt to move across them in the quickest manner possible. Because he wasn’t really supposed to be doing this and faced harsh punishment if he was ever caught, Raymond attempted to train in silence, spending countless hours practising how to land without making a sound. Along with learning to be silent, Raymond would throw himself from increasingly dizzying heights to learn to land without hurting himself. After the culmination of the Indochina war in 1954, Raymond was granted French citizenship and taken back to France where he stayed in military education right up until just before his 19th birthday in 1958. After graduating, he decided to put his athletic skills to good use and become a member of the Paris military fire-fighting regiment (known in France as the sapeurs-pompiers). It was during his training with the Paris fire service that Raymond is said to have encountered the teachings of one Georges Hébert, a famed physical education expert who also happened to be the original inventor of the military obstacle courses Raymond had used to hone his body and skills in his youth. Raymond became fascinated with Hébert’s so-called “méthode naturelle” (French for Natural Method) of training. In a nutshell, the “natural method” consisted of a series of 10 basic exercises that Hébert believed were essential to good, all round physical fitness. These exercises included running, climbing, walking, both on two feet and on all fours, swimming, throwing, lifting, self-defence, jumping, and balancing. 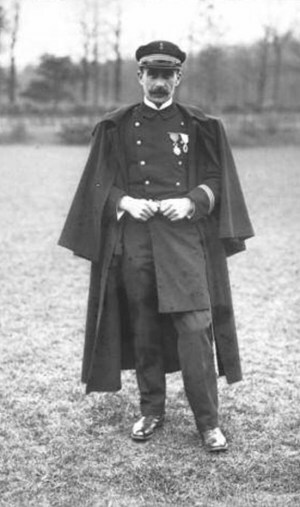 Hébert was supposedly inspired to create this more natural approach to physical fitness during his time as a naval officer in the early 20th century, during which he often encountered indigenous peoples whose physical fitness and ability to move across uneven, sometimes dangerous terrain in a seemingly natural and fluid way made him believe that an organic approach to fitness was superior to the more regimented one favoured at the time. Hébert’s favourite motto, “Être fort pour être utile” which roughly translates to “be strong to be useful”, is also said to have deeply resonated with Raymond. 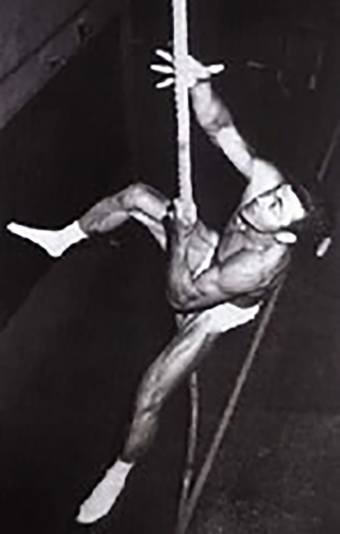 During his fire-fighter training, Raymond established himself as one of the most capable recruits by smashing virtually every record they had for the obstacle course and then doubling down by winning several fire-fighting competitions, particularly being adept at rope climbing. After training, Belle’s superior athleticism swiftly saw him become a legend in the fire-fighting community, with Belle often being called on to take on the most dangerous missions the service faced. Perhaps Belle’s most famous exploit, at least as far as the general public is concerned, is when he hung from a helicopter in order to grab a Vietnamese flag that had been attached to the top of a flagpole about 300 feet up on the top of Notre Dame in Paris the day before (noted as being the first helicopter mission ever undertaken by the service). Raymond would also astound his peers by scaling buildings in seconds without a ladder by climbing up the drain pipe and walking naturally along small ledges, dozens of feet in the air without assistance. However, it’s the stuff Raymond did behind the scenes that really made him famous amongst fire-fighters. You see, due to his almost unique ability to traverse the environment using what could be viewed as a rudimentary form of parkour, Raymond was often tasked with training new recruits and even members of the military in how to move more efficiently through an urban environment. During one such training exercise, it’s said that Raymond spoke to a number of new recruits about how not fearing heights was essential to being a good fire-fighter, before running at full sprint to a nearby window and doing a front-flip out of it in full fire-fighting uniform. Stories like these were passed on to Raymond’s son David, who was so inspired by his father’s almost superhuman exploits that he began to emulate them, eventually resulting in him developing parkour- a more flexible version of the “méthode naturelle” system of training Raymond believed in that stressed efficiency of movement over natural obstacles. Raymond’s teaching lives on not only through his son David, but through the French fire fighting service of which his other son is a member. To this day, the sapeurs-pompiers hone their skills by engaging in competitions between one another to scale obstacles, climb ladders and carry weights over uneven ground. They’ve also been known to train in parkour from time to time with David. The word “Parkour” is taken from the French word for the classic obstacle course designed by Georges Hébert for the military, “parcours du combattant” on which David Belle’s father trained in his youth. It’s noted by David Belle that the word parkour was first coined by a close friend called, Hubert Kounde. Parkour is often confused for free running, although both disciplines focus on moving through an environment, parkour focusses on efficiency whereas free running focusses more on expression (read: doing cool flips). So the easiest way to tell the difference between the two is to remember that parkour doesn’t involve flips or other unnecessary, inefficient movements. Interestingly, free running is credited to Sébastien Foucan, an early forerunner of the parkour movement. Raymond almost never spoke about his life and isn’t known to have given any interviews during his lifetime. As a result, much of what we know about his life is based on information contained in his son David’s book, simply titled “Parkour” and newspaper clippings discussing his exploits as a fire-fighter. No Obstacles: Navigating the world by leaps and bounds.